Last night my daughter was feeling off it and she just wanted to be hugged. As she is rapidly growing up and not always asking for this, I relished in holding her and being able to offer her comfort. My daughter constantly chatters and she could not resist talking whilst we were having a quiet moment! She was telling me about her card she is making for me on Mother’s Day at school and was asking me about Mother’s Day. Afterwards it made me reflect on Mother’s Day and think about numerous clients who come through my door with post-natal depression. One subject they often talk about is the feeling that they have failed as a Mum and don’t deserve anything on Mother’s Day. In fact they dread the day. Being a Mum can be a roller coaster ride. In a day you can go from feeling proud of your child, to feeling embarrassed by them or even feeling cross towards them. I think most Mum’s will agree with me it is a role that you learn as you ‘go’. We often get it wrong but thankfully most days we get it right. However, new Mum’s with post-natal depression often go through turmoil thinking that they are failures as they cannot enjoy parenthood as they feel depressed all the time. We now know that although most Mum’s recover from post-natal depression, some will continue to feel depressed throughout their children s toddler years. Post-natal has many different symptoms which can be found here. A post-natal Mum who socially withdraws and feels worthless can often be misunderstood as someone who wants to be on their own or they can be seen as negative person. This leads to the Mum suffering from post-natal depression feeling rejected and an increase of their sense of worthlessness and isolation. They feel they are in a fog of hurt; hating themselves with feelings of failure. Then Mother’s day comes along. They know they should be feeling blessed and proud, yet the day just reminds them that they are a complete failure. She has to hide her hurt, maybe even paint a perfect day on social media yet underneath they are just hurting. They are crying inside and feel lonely. Maybe this Mother’s Day is the day to start exploring these feelings and start talking. Below are five positive steps post-natal depressed Mums can do to help themselves this weekend. Remember to tell yourself post-natal depression is not your fault. It can happen to anyone. Start by not blaming yourself. You are not a failure. Try to be positive and speak out about your feelings. Try chatting to a friend who is willing to listen or contact a support helpline such as PANDA. This will allow you to reach out to other Mum’s who have experienced post-natal depression. They will have the understanding and experience of post-natal depression as well as give you the time to listen at a time that suits you. On Mother’s day write about the times you have enjoyed being with your son or daughter and the few times you have seen them smile. This will help you remind you that your child is a healthy, happy child and together you can have good times with them. Set yourself small tasks to do. At the end of the day, tick them off. This will help you see that you can achieve positive things. Finally most importantly, stop comparing yourself to others. You are doing what you can at your own pace. 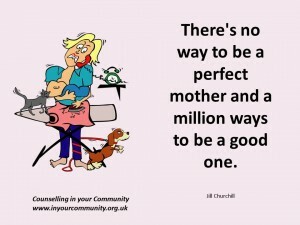 Look in the mirror and tell yourself that you are a great Mum.